Youtube is as the source we all are familiar with to earn good handsome amount. In previous times as youtube was banned in Pakistan, but now meanwhile many of the Pakistani are working as a Youtubers and running their different channels accordingly. It’s the best source to record videos and makes vlogs they are occupied with. First Pakistani Woman Youtuber has achieved a great milestone. Let’s talk about that. Well, a YouTuber job is so restless still they do manage it to provide us entertainment whether from comic to games or cooking methods. Talking about Pakistani Youtubers, then there goes a long list. Some of the top Pakistani YouTubers like ZaidAliT, Shaam Idrees, Karachi Wynez, Mooroo, Amna and Wajeeh, Pardesi Rahim. They are famous for their hard work and running a successful youtube channel. If we talk about YouTube channels than there are many cooking channels for women as well. They are rising like a shining star. Cooking channels like Hum Masala TV, ARY Zauq, a channel show Master Chef and more are here to provide you best of the recipes. And the best thing is the one who has subscribed 1m subscribers on youtube channel is a woman too. The first Pakistani woman YouTuber is also running a cooking channel. Pakistani women are just going side by side with men. Yes! The amazing fact about which we are talking is ONE MILLION SUBSCRIBERS on a youtube channel. 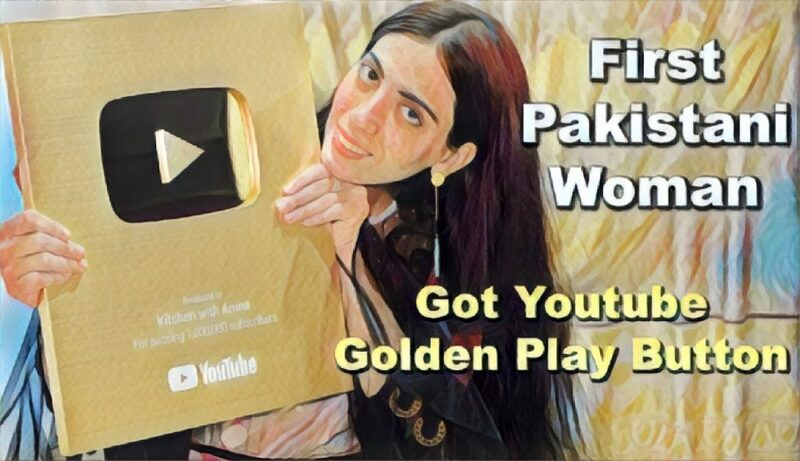 Isn’t it amazing that the YouTuber who has achieved this milestone is a first Pakistani woman Youtuber? ‘Kitchen with Amna’ a YouTube channel run by Amna has won a golden play button by Youtube for completing the 1 million subscribers on its channel. First Pakistani Woman Youtuber Amna has a channel in which she gives the recipes of delicious food. Rather it’s Continental, Non-continental, Chinese, Italian or Thai, she is master of all tastes. RECIPE FOR PANCAKES MUST TRY! Amna has started her journey in 2016 by uploading home based recipes which are very easy to make. You can also get the yummy recipes of smoothies, desserts, milkshakes and different beverages on First Pakistani Woman Youtuber channel ‘kitchen with Amna’. Her videos are not more than 4min long and most of them contain 1million views on them. Amna has an aim to reach 10m subscribers and to win Diamond play button from youtube, and then to set a record of First Pakistani Woman Youtuber having 10m subscribers for its channel. The biggest and most visited youtube channel of Pakistan is The Coke Studio. It consisted of 4 million subscribers till now. A youtube channel which is famous for passionate music and amazing songs. We the Deikhoo team is proud of this amazing news and we wish Amna best of luck to achieve the next goal of becoming First Pakistani Woman YouTuber with 10m subscribers!